Today we're excited to feature a West coast wedding from the beautiful city of Seattle, Washington! 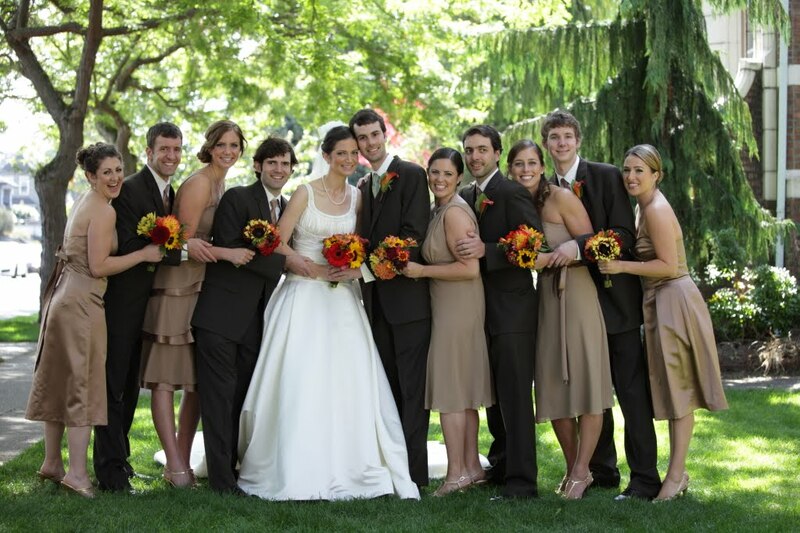 Gina and Patrick were married last September at St Benedict's Church, followed by a reception at St. Demetrios Hall. With a muted color palette for her bridal party, the bouquets really popped against the luscious green backdrop. All the rain finally does pay off in the summer season for Seattleites. 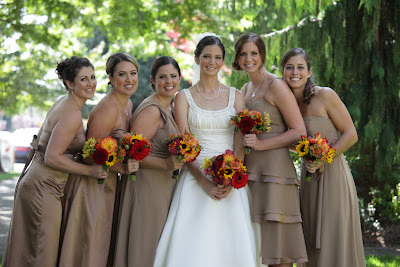 The bridesmaids wore a mix of After Six styles in the color Cappuccino. 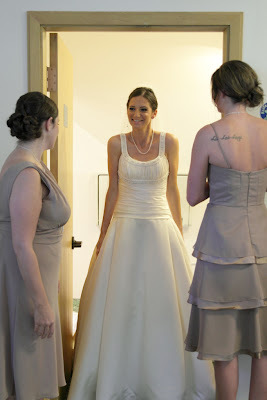 "The bridesmaids dresses turned out wonderful!! We were very happy with our choice to go with Joielle. " Gina's favorite moment was right before she saw Patrick for the first time. "I remember telling my little sister that it felt like when we were kids and on Christmas we had to sit at the top of the stairs waiting until our parents got coffee and got their cameras ready before we could come sprinting down the stairs to see what Santa brought us. I was just giddy with excitement and wanted to keep asking "can I go yet? can I?" 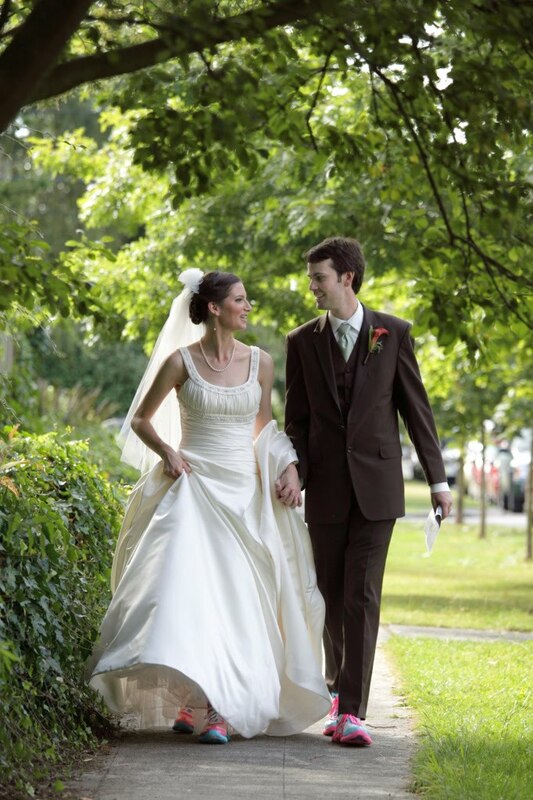 I was so excited to start that special day with Patrick!" Here is a shot of her "giddy" moment. 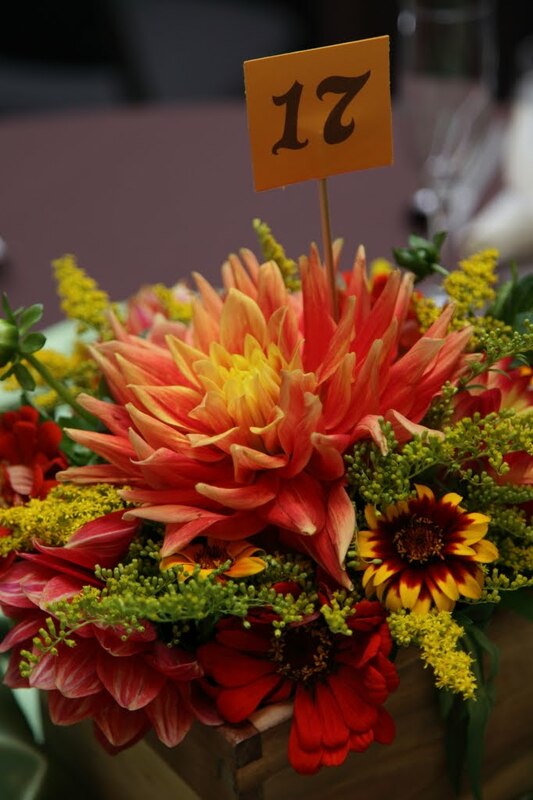 The flowers in their centerpieces were all from the Pike Place in downtown Seattle. What a great idea to pick up fresh flowers from local vendors! When I visited to Seattle a few years ago, I remember being completely enthralled by the vast array of wildflowers at the market. Between the ceremony and reception, Gina and Patrick organized a scavenger hunt around the neighborhood for their guests. 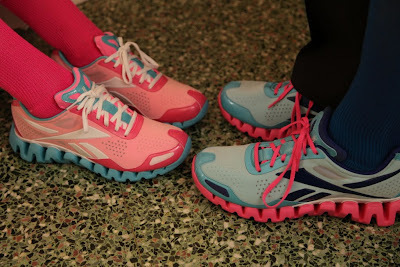 Patrick designed custom sneakers for them to participate too. Love the pink and baby blue! And finally the "money shot", which Gina's mom calls their "Get Smart" spy pose. How can you not love this adorable couple? Gina couldn't say enough about how much fun wedding planning was for her. She saw it as an opportunity to have shared experiences with family and friends. "We were blessed to have extra family and friends time, and seeing how much these people loved us and wanted to be there to help was wonderful!" To top if off, their wedding day was also Gina's sister's 21st birthday, so they surprised her with a birthday cake and song at the end of the reception. 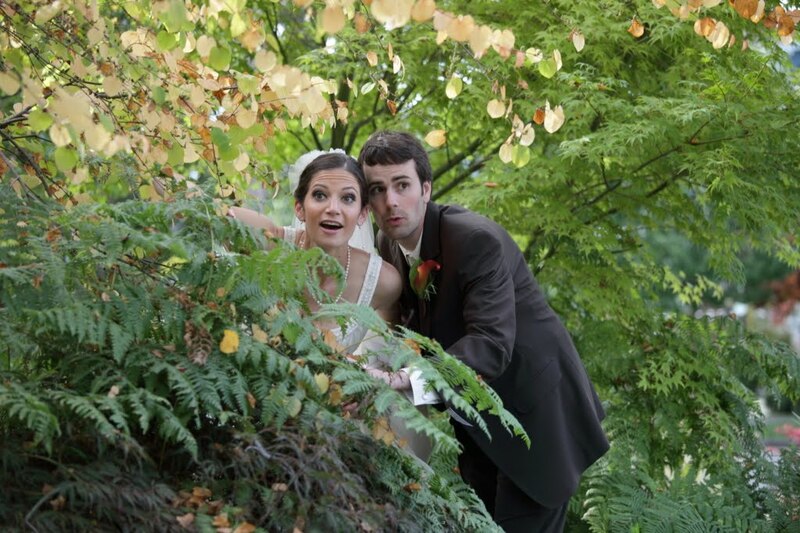 Thanks Gina and Patrick for sharing all the fun and excitement from your wedding day. May you always be a ray of sunshine for each other and for your dear family and friends!